Lancer Vanessa Monrreal at a recent meet. 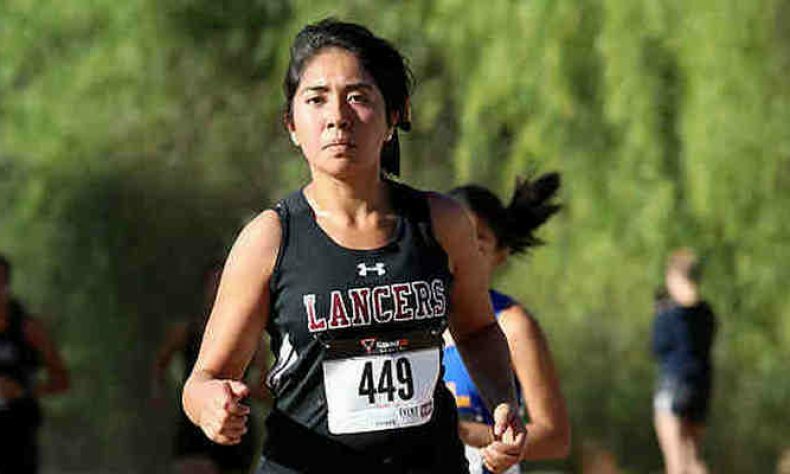 Someone has to finish last in any race, but unfortunately for the Pasadena City College women’s cross country team, it was its turn for that dubious spot at the Mt. San Antonio Invitational meet held October 13. PCC finished in 14th place officially. The Lancers had no runners reach the upper half of the 125 total racers competing, although Yasmeen Barrios was literally in the middle of the pack as PCC’s top finisher in 63rd place in 22:13.2 over the 3-mile course. Raylin Galvan placed 73rd in 22:39.6. Other PCC runners were Melissa Olivas (98th, 24:13), Vanessa Monrreal (103rd, 24:49), and Paola Jimenez (104th, 24:49.5). The event was PCC’s last competition in preparation for the South Coast Conference Championships next Friday, Oct. 27, also at Mt. SAC. At their invite, the host Mounties won the team title while Oxnard’s Briana Valencia was the individual race winner in 18:33.6.